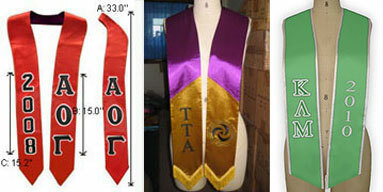 Leading vendor of Greek Stoles for fraternities and sororities. Fraternities and sororities should demand only the finest Greek stoles made from top quality satin fabrics, and detailed embroidery or print work. 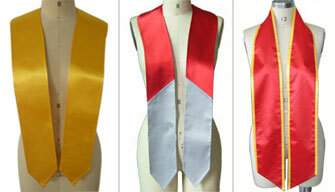 We supply the highest quality wholesale Greek graduation stoles and sashes. We supply custom orders of stoles and sashes with Greek characters either skillfully embroidered on to the front or imprinted using various techniques. We can also supply Greek stoles with appliquéd characters. Please visit our main page or one of our resellers based in the USA. Lowest Prices – Free Design Work – Top Quality - Free Shipping! Customized and personalized Greek stoles are an excellent and long lasting momentum of this very special moment in any graduate's life. We will assist in the design of your stoles for free. Copyright © 2006 -2019 Final Step Ltd. All rights reserved.